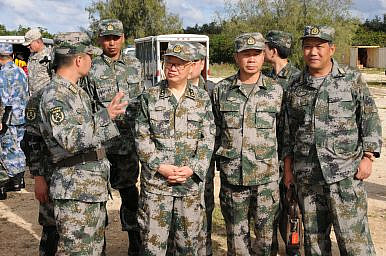 Senior leaders with the Peoples Liberation Army observe a practical field exchange during Disaster Management Exchange 2013 at the U.S. Marine Corps Training Area Bellows, Marine Corps Base Hawaii, Kaneohe Bay, Hawaii, Nov. 12, 2013. What Every Chinese Soldier Knows (Part 4): Rescue! Follow the Chinese Army into danger from the safety of your home. July 1976. Summer in a gritty industrial town not far from Beijing. Factories go dark as residents return home to relax, surrendering to irresistible heat and languor in the final days of Maoist China. But one should never be too complacent. Sometime after 3 am a tremendous earthquake convulses the town of Tangshan, rattling the entire province in an echo of the human calamities of the past few decades. In a rundown barracks not far from the city an army company sleeps. Two night watchmen immediately realize this is no ordinary shaking and race to sound the klaxon and rouse the troops. The captain, being up, quickly brings his company to alert. Not long after comes the order from higher up: move with all haste to the nearby county seat to move the people to safety and conduct search and rescue for survivors. Within ten minutes of the order the company stands at the ready, green suited troops armed with shovel, pick, and crowbar, all in good order. The political officer exhorts them: “We are the people’s army. We must protect the lives and property of our people, even at the cost of our own! Chairman Mao is watching how we serve the people in their time of greatest danger!” Five minutes later the commander is moving purposefully out the old front gate, red banner and column of soldiers close in tow. A few hours’ of hard marching later, the People’s Liberation Army arrives at the county seat, little more than two rows of buildings and a main street. Several buildings have fallen and the local Party leader is missing, but two of his deputies are on scene to help steer the army in the most useful direction. The strongest troops immediately begin digging around collapsed apartment buildings. They don’t look like much, but they have strength where it counts: in determination, fierce loyalty, and an indifference to hardship born of a lifetime of struggle. What they lack in proper equipment they made up for in spirit and teamwork. Private Liu grew up in the country near Tianjin and at 19 years old felt lucky to join the military as a conscript. Now a year later he works alongside his comrades to save his countrymen by digging through bottomless pile of earth looking for survivors. There are precious few they manage to pull out of the poorly constructed hulks now collapsed, but those few are indeed precious to Liu. The political officer as well takes an interest, carefully noting their names to report to battalion command. After 30 hours of non-stop work relief finally arrives, but he doesn’t stop. He cannot sleep while the people still need his assistance. He takes ill with exhaustion and fever, but still doesn’t relent. At last his body gives out. The regional commander will later present his hero’s medal (“2nd class,” but not second rate) to his grieving parents. Over a few harrowing days, at least 240,000 of those who survived the Cultural Revolution (and in many cases the famines and wars before that) would find peace at last. But some would be saved – just as they had been after each disaster, and as they soon would be after Mao’s passing – by the arrival of the PLA, never more an army of the people than during rescue operations. The above is a fictionalized account of Unit 81228’s role in the Tangshan earthquake based on an account in the PLA’s old Soldier’s Handbook. To this day, the PLA prides itself on providing disaster relief to Chinese people in times of need, by which it burnishes its image while contributing to the national economy. Stationed throughout the country, each PLA unit has a duty to support citizens in their area as first responders to natural disasters… and other emergencies.